Anti-foaming additive suppresses foam when all types of crude oil tanks are being cleaned. 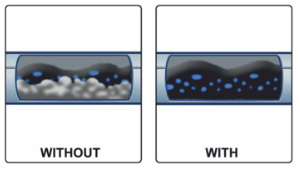 Foaming is a function of crude oil type which either permits small gaseous bubbles to be encased in a thin film of crude oil as the gas comes out of the crude oil solution or permits gaseous bubbles as the viscosity and surface tension of the crude oil changes and mechanically unlocks the gas. Anti-foaming additive avoids operational cost increases due to foam induced crude oil supply disruption. Anti-foaming solutions have employed chemicals, heat, or mechanical processes such as settling, agitation, or centrifugal force. Each process provides solutions, but can also create additional problems necessitating further remediation. OilFlux™ S16 Anti-foaming additive employs new chemistry to solve the foaming challenge without creating additional problems necessitating further remediation. 1- Callaghan, I.C., McKechnie, A.L., Ray, J.E. et al. 1985. Identification of Crude Oil Components Responsible for Foaming. SPE J. 25 (2): 171–175. SPE-12342-PA. http://dx.doi.org/10.2118/12342-PA.
2- Roberts, J.R., Basurto, E.R., and Chen, P.Y. 1966. Slosh Design Handbook I, NASA-CR-406, Contract No. NAS 8-11111. Huntsville, Alabama: Northrop Space Laboratories. 3- Carios, E., Vega, L., Pardo, R., and Ibarra, J. 2013. Experimental Study of a Poor Boy Downhole Gas Separator Under Continuous Gas-Liquid Flow. Presented at the SPE Artificial Lift Conference-Americas, Cartagena, Columbia, 21-22 May 2013. SPE-165033-MS. http://dx.doi.org/10.2118/165033-MS.